Military news from Botswana – The Commander of Botswana Defence Force Lt. General Placid Segokgo last week deployed military assets including armoured tanks and personnel in key strategic in anticipation of a coup against President Mokgweetsi Masisi’s government. This followed credible intelligence from the South African Defence Force (SADF) and the United Nations that a coup was building up in Botswana, Sunday Standard can confirm. 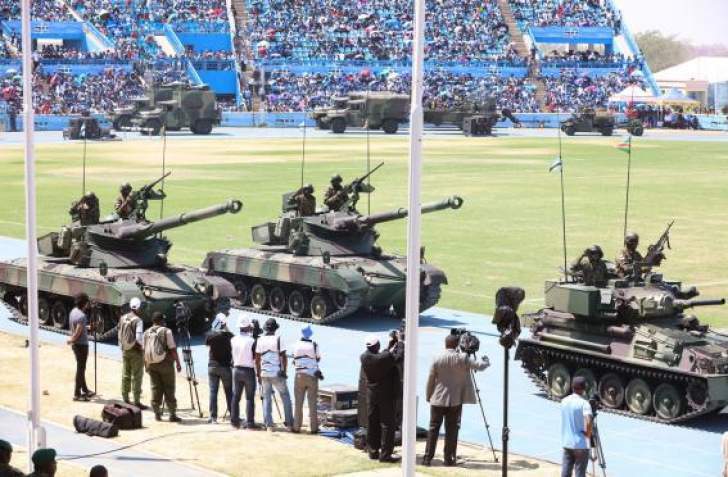 The tanks were placed near the State House where President Mokgweetsi Masisi resides, and around the Mass Media complex that houses the national television broadcaster (Botswana Television) and Radio Botswana. Sunday Standard can reveal that head of the BDF Military Intelligence, Brigadier Modise Tlhage last Friday received tip offs and enquiries from his counterparts in the South African National Defence Force about a looming coup in Botswana. Brigadier Thlage then elevated the intel to the BDF Commander and motivate that it be acted upon. Thereafter a similar enquiry still from South Africa was made this time from the United Nations regional office by a senior executive to the commander of the BDF ground forces. The UN officer said they had received credible information that a coup was afoot in Botswana. Out of caution General Segokgo after informing President Masisi who is also Commander in Chief and placed the army of red alert, which is the highest level of emergency in the army and security warning systems. This involved the drastic military decision to deploy his assets in the public space. The BDF spokesperson however would neither deny that the BDF had deployed assets nor confirm that the army was in possession of credible intelligence regarding a possible coup. The Sunday Standard in January reported that a group of Israeli related mercenaries had tried to topple the Government of President Masisi in July last year. Former President Ian Khama claimed the story had been planted by President Masisi. According to information that Sunday Standard has been able to piece together from local sources and security sources in South Africa and abroad, there are organized interests in the tourism and global diamond industry who are unhappy with the push by President Masisi to give more economic power to Batswana. “You guys in Botswana might have thought relocating the De Beers operations from London to Gaborone was of itself a great thing, but it has come at a huge cost. And it is beginning to show. It has attracted all kinds of bad elements to Botswana” a South African based source who was inadvertently sucked into the earlier coup plot told Sunday Standard recently in Johannesburg. This was part of the newspaper’s ongoing investigation into allegations of a brewing attempt to topple President Masisi. The source is believed to be helping the DIS in its investigations of the coup allegations by the Israelis. The source claimed there was a plan to weaken the democratic and governance structures and render Botswana lawless so that the country could become a reliable conduit for drugs from Afghanistan, through East Africa destined for the West. “Botswana, especially the Maun airport and all the airstrips spread across the Okavango Delta are ideally placed for transporting all the contraband. But this can only work when there is lawlessness” he said. He told the Sunday Standard that Mozambique based drug lords together with the Serbian mafia that sprawl South Africa and East Africa were actively eyeing Botswana. He said this underworld had close relations with some political elite in Botswana that was interested in poaching rhino horns and also the elephant tusks destined for Asia and also trafficked through Uganda and Kenya. Since news of an aborted coup, Sunday Standard has learnt that the intelligence services had been tracking a small group of suspicious looking men who had arrived into the country a few days prior. The military assets that had been deployed by BDF did not escape the public attention. “I think I saw a big military tank by Btv on the back road that joins Wellie Seboni on Saturday night around 10 pm and two smaller military tanks by the main entrance around 5am today (Monday) I should have my mind and eyes checked,” a member of the public known to Sunday Standard wrote on his Tweeter Account.